Jake wears Shirt Vintage. Joe wears T-Shirt YMC. Chloe wears Dress Monki. James wears T-Shirt Vintage and Button-Down American Apparel. “Bombs will drop, and the world will shake / Don’t believe a word they say / Pull the trigger now or face your fate / In a messed up place where hate breeds hate”, sings frontman of INHEAVEN, James Taylor in one of the most powerful songs, “Baby’s Alright”. The South London quartet INHEAVEN started off by making fanzines and producing their own artwork. 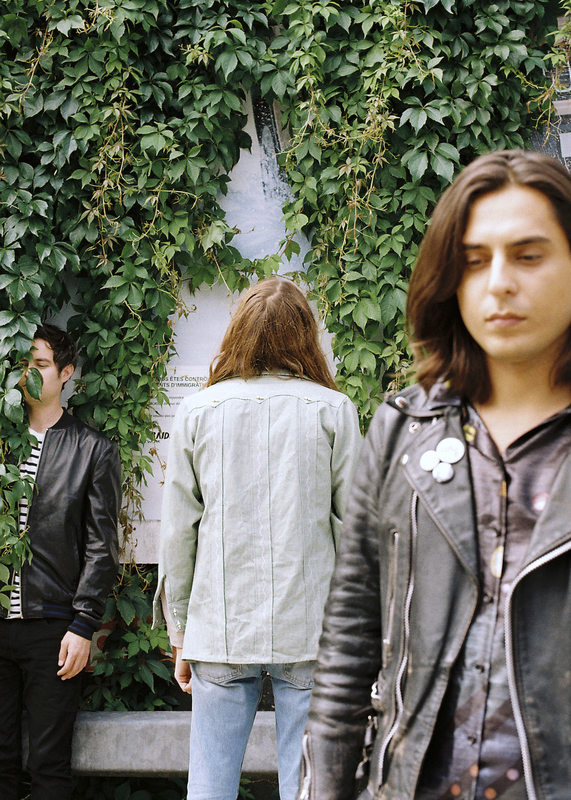 Not long after the release of their first music video for “Regeneration”, they received the seal of approval from The Strokes frontman Julian Casablancas and released their debut single on his own Cult Records. The band has been consistently busy either in the studio or on tour since their first release and haven’t stopped since. 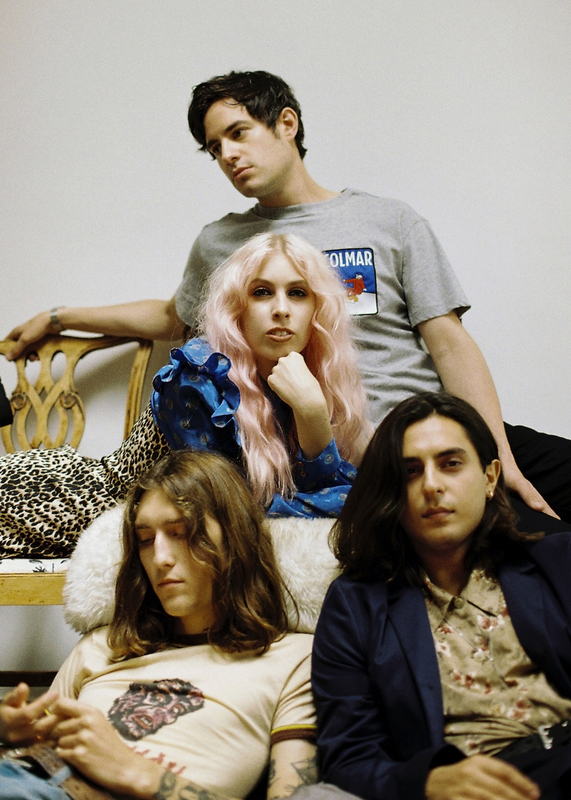 Armed with a DIY aesthetic that certainly makes them stand out from the crowd, INHEAVEN is definitely on the road to success. We caught up with the James and talked about music, influences and art. Jake wears T-Shirt and Belt Vintage, Jeans Levi’s. 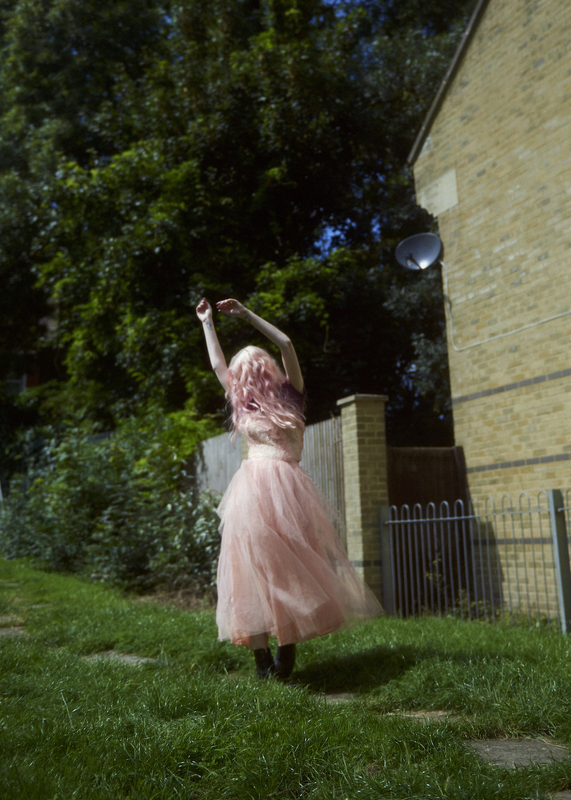 Chloe wears Dress Blitz London, Shirt Beyond Retro. Joe wears T-Shirt Colmar, Jeans Levi’s. Jamie wears Shirt and Jeans Vintage, Blazer Natural Selection London. What happened when you released your first track? Was there a rush of attention? James Taylor: We initially started by making this weird website with loads of tracks hidden in different parts of the site. We would put out one track a week and write emails to all these different blogs. The songs ended up getting written about around the world, and we then got an email from Julian Casablancas and Cult records who ended up putting out our first single “Regeneration”. When putting out “Regeneration”, did you think about what you were going to do next? Not really, you never know how people are going to react to your music. “Regeneration” ended up being the catalyst for everything, and releasing it into the world was one of the best things we ever did. Growing up, what kind of music were you listening to? I was a massive fan of bands like Smashing Pumpkins, Oasis, Nirvana, The Strokes, which are all bands of cultural relevance and importance. I always liked groups who took pride in their songwriting. The first album I ever bought was Be Here Now by Oasis. I loved it at the time but in hindsight, it’s probably one of their worst records! I heard that Chloe is making your own INHEAVEN fanzine. How did that start? Also, I know all your videos are self-made – do you think being able to have that DIY approach to your work has helped you grow as artists and discover your identity as a band? Yeah, Chloe started making the fanzines for each single we released. We wanted to bring back the collectability of band merchandise that we remember growing up when wearing a t-shirt or tip-exing your school bag with your favourite band was a badge of honour. We already get kids at our shows who have made their own INHEAVEN t-shirts and jackets. I think we already had a strong sense of identity as a band and our DIY approach just solidified that and put it into action! Do you see the visuals being as important as the music? Yeah, we always felt that videos and artwork shouldn’t be throwaway – it’s all part of a unified vision. I think you can always tell when a band’s aesthetic has been made up by a bunch or A&Rs or management teams. We always want everything to 100% come from us. Can you dive into your writing process? Your lyrics appear to be politically and socially motivated. We hold great pride in our songwriting, and it’s always been the most important thing to us closely followed by our live show. We always felt that the best bands have had a say on the times they live in, and how can you not be socially and politically aware in this dark and tense era of humanity. One of my favourite songs is “ Bitter Town”, can you please tell me what the inspiration behind it? You guys have been touring a lot in the past two years. What’s the best and the worst part about being on tour? The best part of being on tour is seeing all the places you never thought you would see, plus meeting new and amazing people every day! The worst part is probably eating bad food and spending a lot of time in bleak service stations. I always look forward to playing Birmingham and Newcastle, it kicks off big time, and people seem to really be open to losing themselves in our music. Joe wears Iceberg Bomber Jacket, FARAH T-Shirt, Levi’s Jeans. Jake wears Vintage Jeans, Beyond Retro Jacket. James wears his own Vintage Jacket, Iceberg Shirt. 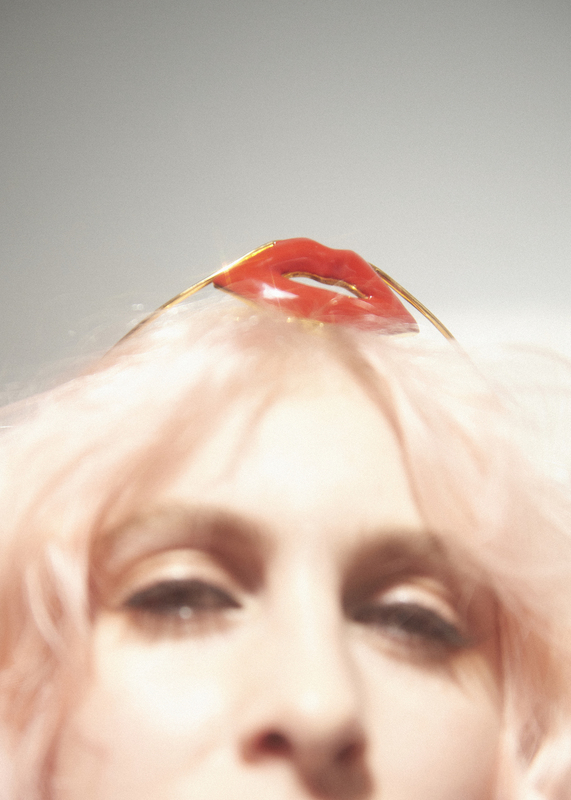 What is the story behind the new single “Stupid Things”? “Stupid Things” is a song for daydreamers. It’s about a love that exists outside of reality. It’s a romanticism you’ve created in your own head, but in the real world, you have never even spoken to this person you think you know so well. It’s a school crush that feels like it will last forever. And it’s our very own coming of age soundtrack. Write as many songs as you can and rehearse them till your fingers drop off. We also live in an age where you can take things into your own hands. The internet is a powerful tool for any new band! I think my favourite song I’ve ever written is “Regeneration”, it was the first song I wrote for the band and the song that sparked everything that came after it. If you could switch bodies with someone for a day, who would it be and what would you do? If I could switch bodies with someone, it would probably be Kurt Cobain. I find him fascinating and would love to find out what was going on in that amazing brain of his. There many good bands/artists in the UK. Who do you think should be on our radar? Pale Waves, Bloxx, And King Nun – they are our past and future touring buddies and some of the best new bands around! What do you do for fun apart from playing music? We don’t really do anything else; we love making music, videos and creating our own artwork, so that takes up 100% of our time at the moment. Maybe one day we’ll discover otherworldly delights. What’s happening for you next? We just released our debut album on the 1st of September, and now we will be touring the UK and Europe through October and November! 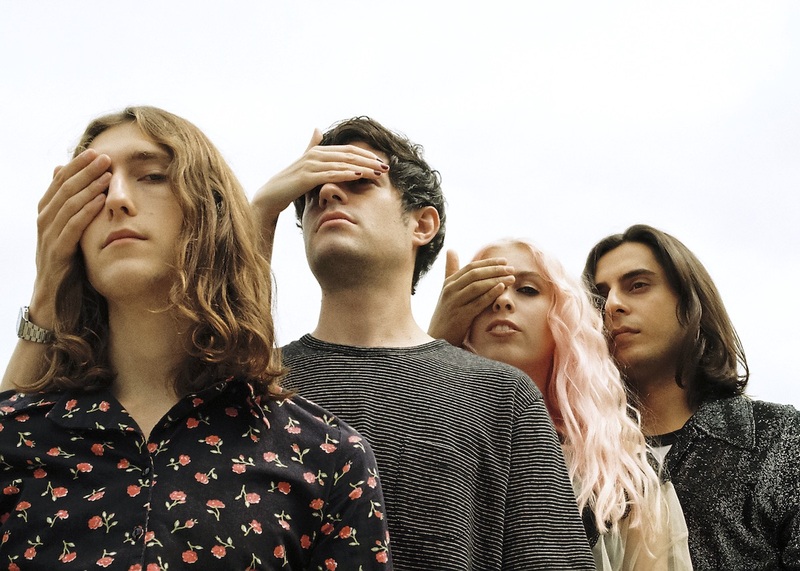 INHEAVEN’s self-titled debut album is now available for purchase through their website and can be streamed via Soundcloud.